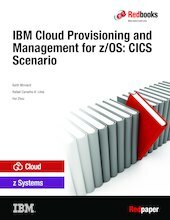 In this IBM® Redbooks® publication, we show you a cloud services scenario on IBM z/OS®. Subscribe to a service to provision an IBM CICS® system. Assign resources to the CICS system. Use that service to create a CICS region and start it. Deprovision the CICS region once it is no longer required. We explain the basic terms that are associated with the cloud services and which roles play a part in creating, using, and maintaining a cloud service. We show you how we used IBM z/OSMF to provision a CICS Transaction Server (TS) System Management Single Server (SMSS) in a controlled laboratory environment. The goal of this paper is to provide you with an overview of how a cloud service can be created and used on z/OS. This paper is intended for infrastructure support staff and application development staff who require middleware to develop and maintain business applications that use middleware.